It’s not difficult to get a personal website up and running. But it can be a little daunting to put together a site that showcases you and your professional achievements. What your personal website says about you can make or break your chances of getting hired. No pressure, right? While it might seem intimidating to put yourself out there online, don’t skip it! A personal website is an important piece of your professional puzzle. Not only is it a place to display your resume and contact info, your personal website gives you increased visibility online. Considering more than 80% of recruiters google candidates before considering them for a job, you want to take control of your digital footprint. And since half the battle of getting an interview is showing up on a recruiter’s radar, your personal website makes it much easier to get found. Your resume does a great job of outlining your work history. It’s not so great at demonstrating your personality. A personal website punches up the personality factor while showcasing your professional prowess — win, win. A recent survey found recruiters were more wowed by a personal website than any other personal branding tool. It signals to others that you take your career seriously enough to invest time and money it in it. Clearly, this speaks volumes to recruiters who are constantly on the hunt for the best and brightest. In today’s digital world it’s not a matter of if a recruiter will google you, but what they’ll find out about you. With your own personal website you get control over what comes up in google searches. Having a professional online footprint lets you stand out in the crowd (in the most positive way possible). So, whether you want to establish yourself as an expert in your field, are contemplating a career change or actively seeking a new job, don’t underestimate the power of a personal website in helping you reach your professional goals. Ready to take charge of your own professional virtual presence? Let’s get started. Every website needs two basic things to get online: hosting and a domain name. Your domain name is the physical address where your website is found, i.e., www.yourpersonalbrandingsite.com. Hosting is how your site ‘lives’ online. Think of your host as your site’s landlord. You’ll pay a small ‘rent’ each month to your hosting provider in order to keep your personal website online. And because BlueHost knows you’ll be oh-so happy with their hosting, they offer a 30-day money back guarantee. If you’re not happy, they’ll make it right or refund you — no questions asked. Don’t panic if your name is taken. You can add your middle initial. You can also throw in a descriptive word relevant to what you do. For example, AshleeAndersonWrites.com or AshleeAndersonBlogs.com. Just try to keep it as simple as possible. And make sure your professional name you use on your resume is in there! This is great for search engine optimization (SEO) and increases the chance of your personal website showing up in searches when a recruiter googles you. This welcome screen explains the benefits of BlueHost and offers you a discount for being a Work From Home Happiness reader — woot woot! Simply click the green “get started now” button to move on. BlueHost offers different plans to meet a variety of hosting needs. Because you’re looking to set up a professional website, the “starter package” will meet all your needs (and then some). With this plan, you’ll receive your free domain name and monthly hosting for as little as $3.95 per month. 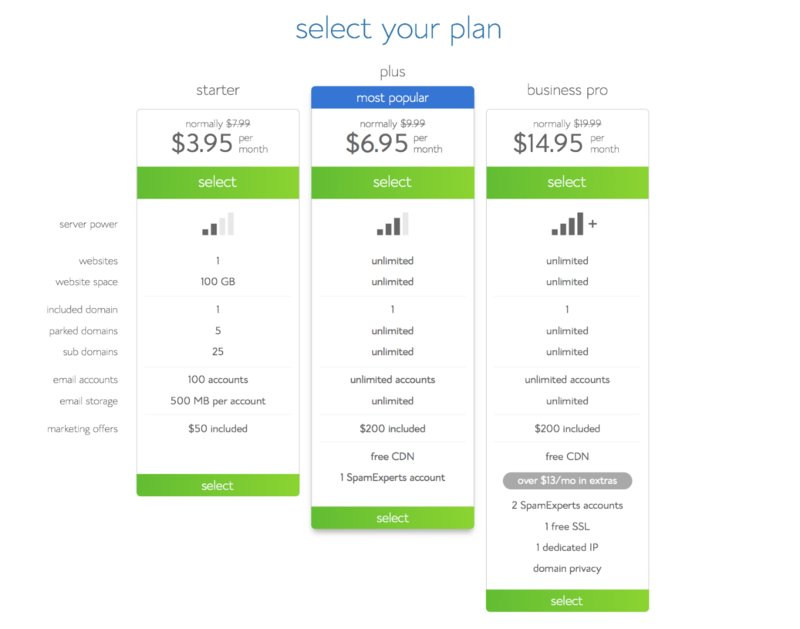 Once you select the starter plan, you’re automatically directed to the next page where you’ll claim your domain name. If you used the free domain name checker, you should already have the domain name you want to purchase in mind. During this step you’ll actually claim that name and make it your own. Simply type your chosen domain name in the “new domain” box on the left (or the transfer domain box if you already have one). Hit the blue “next” button to move forward. You now grabbed your professional website domain name (congrats, btw!). During the next step, you’ll provide your contact information to BlueHost. 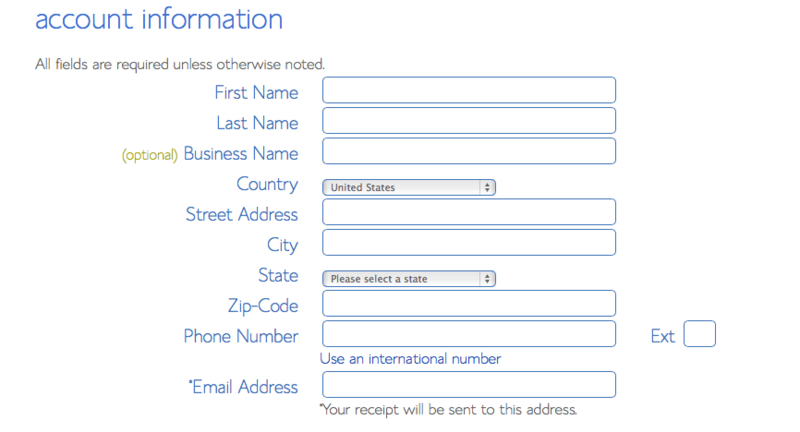 Simply fill in the form on this page with your current contact info. Double check everything for accuracy! The provided email address will be the primary means of communication between you and BlueHost. It’s also where your receipt will be emailed! Now that you’ve selected your domain and provided your contact deets, it’s time to to officially choose your hosting package. Remember, since you’re building a professional website, the starter package will meet all your hosting needs. And when you prepay 36 months in advance, you’ll receive hosting for just $3.95 a month — that’s less than the cost of a latte. Plus, you’ll know that your professional website will be ready and raring to go for the next three years to meet all your career and personal branding goals! That’s up to you. I always swing for Domain Whois Privacy. Why? Whenever you purchase a domain, your contact information must go into a database. It’s the law. With Whois Privacy, a proxy name is used. This protects your privacy but still gives the required contact information the law requires. However, it’s completely optional. You do not need any extras to get your personal website up and running. Congratulations! You’ve officially purchased your personal piece of the Internet and are one step closer to personal branding perfection. Now that you’ve purchased hosting and received your free domain name via BlueHost, it’s time to install WordPress. WordPress is a content management system (CMS). It’s used by big businesses to small bloggers and everyone in between. It’s a popular platform for website creation because it’s so easy to use. Even if you’ve never built a website before, you can use WordPress to create a polished site quickly. And because you chose BlueHost, you can install WordPress for free in just a few clicks. 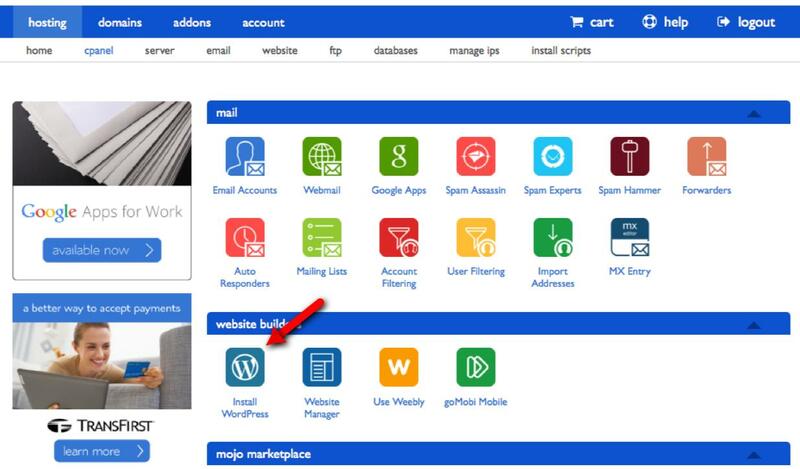 To get started you’ll need to login to your new BlueHost account and navigate to cPanel. Your cPanel is like a command center. This is where you can access different apps and software to build your website. It’s also where you can install WordPress. 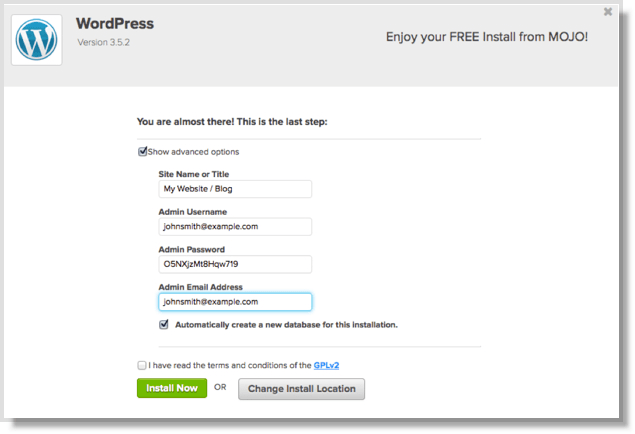 To do that, simply click the “install WordPress” button. Now you need to select the domain name you want to install WordPress on. In the case, it’s your professional website domain. 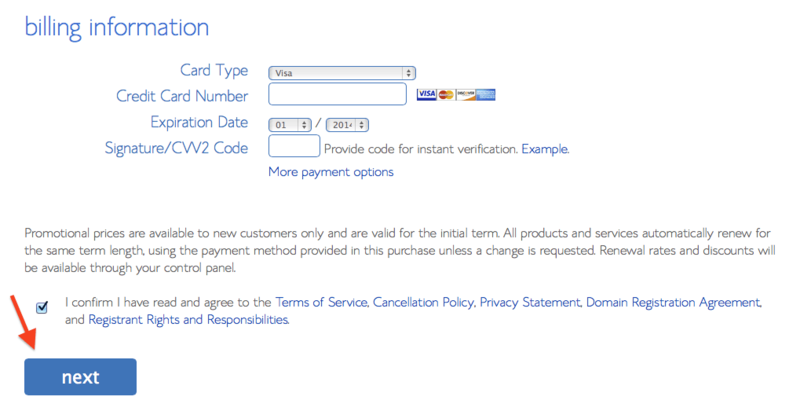 Once the correct domain is selected, you can begin the installation process. BlueHost automatically does this for you once you hit the “install now” button. But before you hit the “install now” button, make sure you change your Site Name, Admin Username, Admin Password, and Admin Email Address. Save this information! 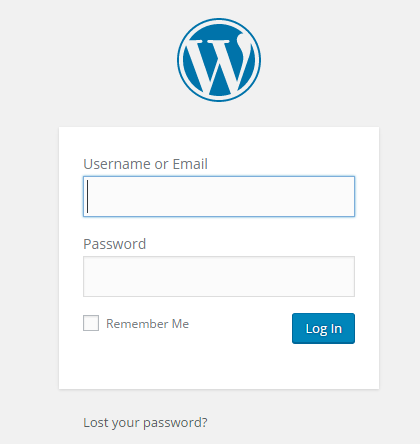 These are the login details you’ll to access your WordPress site. Once you’ve put in all the information, hit the green “install now” button. It may take a minute to finish installation, so just sit tight. But that’s it! 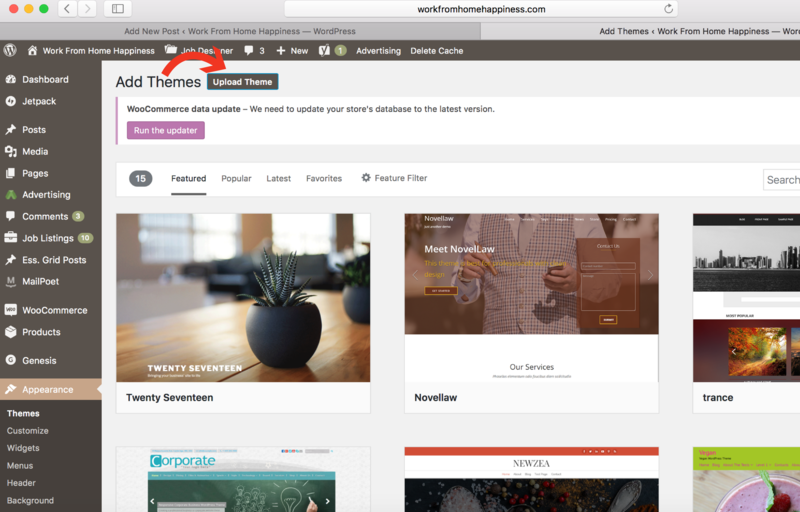 You officially installed WordPress to your personal website! Now it’s time to make it your own. This is where you’ll type in the username and password you selected during the WordPress installation process. From there, hit the blue “login” button. 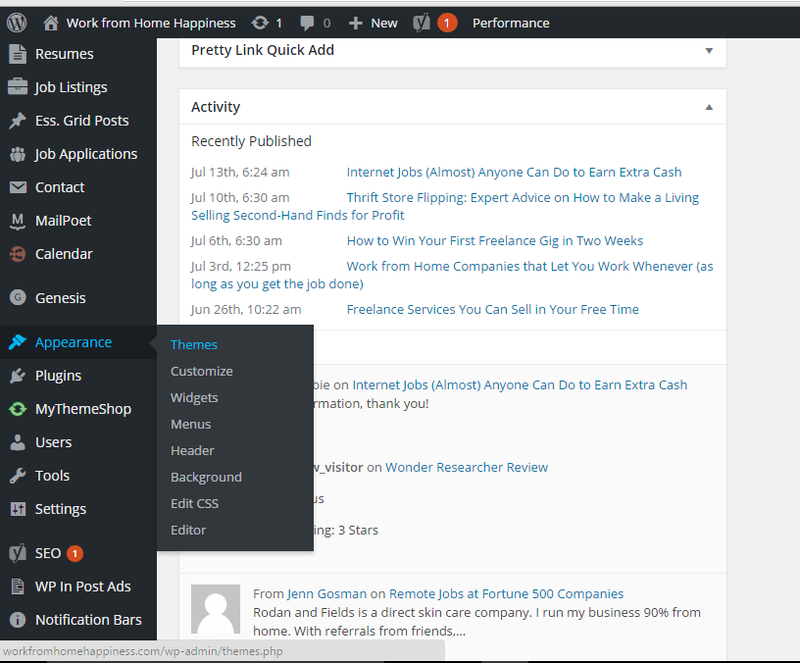 Once you login, you’ll land on your WordPress Dashboard. At first glance, it’s overwhelming. But don’t be intimidated. You’ll use your dashboard to navigate the back end of your site. It’s where you’ll create content and customize your personal website to make it your own! What makes WordPress easy to customize without coding are the many themes available to use. With the right WordPress theme installed, half the work is done for you. I promise. Think of it in terms of a house. WordPress are the walls to your website and your theme is the decor. The theme you use can make all the difference in how professional your site looks. For a modern, professional personal website I recommend the Hired theme by Modern Themes. You can also grab a premium copy of the theme for just $25. The premium version comes loaded with even more options that’ll help make your personal website as unique as you. Whether you choose Hired or another resume theme, the steps to get it onto your WordPress site are the same. First things first, download the theme. The theme will download as a .zip file. Leave it zipped! This takes you to the themes page. Here you’ll see the current themes available to you. By default, WordPress comes with three themes: Twenty Fifteen, Twenty Fourteen, and Twenty Thirteen. You’ll see these themes here. After you click the “add new” button, you’ll be redirected to a theme marketplace of sorts. Here you can search for a new theme or upload one you’ve already downloaded. This is where you can upload the Hired theme you downloaded earlier. Now just hit the “install now” button. 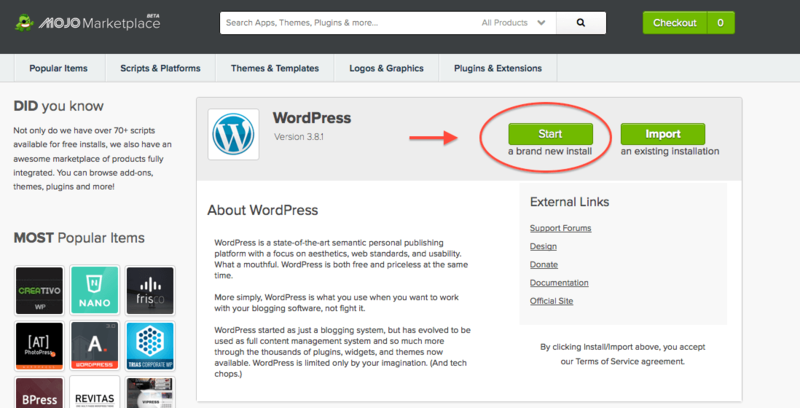 WordPress will automatically install the theme for you! After its installed, you just need to click the “activate” button. That’s it! You’ve now got a professional theme installed on your personal website! Wasn’t that easy? What I love about the Hired theme is the amazing documentation that comes with it. The documentation provided by Modern Themes shows you the steps you can take to set up your site just like the demo. There are even video tutorials and how-to guides to help you every step of the way. But, remember, what you include or don’t include on your personal website is up to you! At the very least, be sure to add your social profiles you’re active on like LinkedIn or Twitter. If your Facebook page is PG-rated, include that too. And don’t forget to add a copy of your resume and an ‘about me’ page to really let your personality shine through. Need extra help? Modern Themes offers installation services for just $15. They’ll get you up and running just like the demo leaving you more time to polish your online presence. Congratulations on getting your personal website up and running. It really can make all the difference in your job search whether you’re contemplating a career change or ready to cement yourself as an expert in your field. For resume assistance and general advice on nailing your social media presence, sign up for the remote workers’ library below. It’s completely free and offers valuable insight into the world of working from home. Have questions? Hit me with them in the comments below. 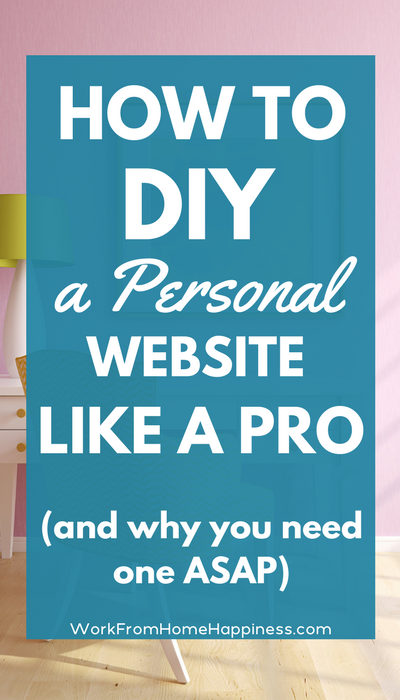 The post How to DIY Your Personal Website Like A Pro (And Why You Need One ASAP) appeared first on Work From Home Happiness. The post How To Work Remote Jobs As A Busy Parent (4 Things You Have to Know) appeared first on Work From Home Happiness.